Access Dublin history anytime, anywhere. The City of Dublin Heritage Center and the Dublin Library are proud participants in the California Local History Digital Resources Project (LHDRP). The goal of LHDRP is to preserve local history resources such as historical photographs, providing permanent public access to a digital version. Working together, the Heritage Center and Dublin Library digitized 200 original photographs owned by the Museum. These photographs tell Dublin’s story from Mexican land grants to early pioneers and immigrants. They reveal Dublin’s farming and ranching roots and its growth from a tiny, rural community to a thriving city. Pioneer families such as the Kolbs, Tehans, Murrays, Reimers and Fallons are well represented, as are historic buildings such as Old St. Raymonds, the Green Store and Murray School. This project is supported in whole or in part by the Institute of Museum and Library Services under the provisions of the Library Services and Technology Act, administered in California by the State Librarian. Meetings: Monthly - 2nd Wednesday at 6:15 p.m. The Friends are a volunteer organization of people interested in books and libraries and committed to supporting the Dublin Library. The Friends offer two booksales a year, sponsor a lobby booksale and silent auction, and sell books online. 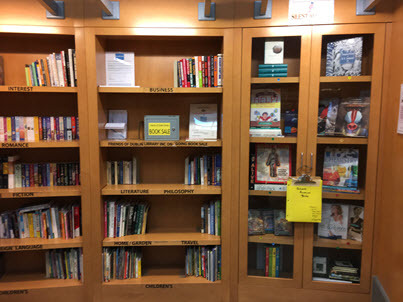 Funds from booksales support programs for children, teens and adults, as well as other service and equipment needs of the Library. The Friends always needs additional volunteers to help sort donations and work the booksales. Newcomers are warmly invited to attend the monthly meetings and find out more about how you can help the Dublin Library. Check out the Friends of the Dublin Library online store.